If there were any one product that totally revolutionized the way I live, work and travel this part year, it would have to be the Voltaic Fuse 4Watt Solar Charger. This small, lightweight solar panel has been strapped to the rear rack of my touring bicycle for the last twelve months and has, on a daily basis, been responsible for charging and re-charging, time and time again, my iPod Touch (which I use all day long for navigation, entertainment, work and more), my GoPro video camera, and several small Lithium camera batteries. I got the Voltaic Fuse over one year ago, but I didn’t want to write this review until I had used it for a significant amount of time. Now that I have used the Fuse every single day for the last 12 months in more than 20 different countries all around the world, it’s time to tell you why I love the Voltaic Fuse and why I think you should get one for your own outdoor adventures just as soon as you possibly can. The basic characteristics of this easy to use solar panel. How the Fuse will forever alter the way you travel with electronics. The best and worst things about the product. Charge time: V11 battery fully charges from 7 hours of direct sun or using any USB port or optional DC or AC chargers. Due to the small size of this particular solar panel, The Voltaic Fuse is not strong enough to power tablets, laptop computers, large Lithium batteries (such as video camera batteries), etc. Instead, the Voltaic Fuse is ideally suited for smaller electronics such as: MP3 players, cell phones, smart phones, GPS devices, small USB powered devices (such as flashlights, bike lights, the GoPro video camera), and a whole host of similar electronic devices. See the Voltaic website for a list of compatible products and adapters. In regards to its size, the Voltaic Fuse is about the size of the lid of a large shoe box, which makes it the perfect size to be strapped onto a backpack, placed on the top of your tent, or (in the case of any bicycle traveler), mounted to the rear rack of your bicycle. 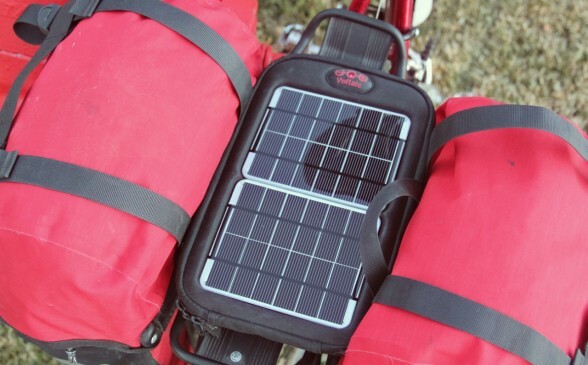 The solar panel itself is lightweight, but the large internal zippered pocket, the multiple included adapters, the rear mounting straps and the included external battery add a significant amount of weight to the device (not so much that it is noticeable when mounted on the rear rack of your bicycle, but certainly enough for hikers to notice when added to the weight of their backpacks). What Makes Voltaic Solar Chargers Better Than Others On The Market? Over the last 10 years I have played around with multiple solar panels (from different companies) on my travels around the world. Some of the products worked, but took forever to charge my electronics. Other solar panels were terribly expensive, but so complicated that I was never able to get them to function properly. Most of the panels I played with over the years worked with some degree of success, but there was no way to tell when my device was finished charging… or whether it was charging at all. This of course, left me frustrated, and ultimately made me think that carrying a solar panel on any outdoor excursion was more work than it was worth. But that’s when I heard about the Voltaic products and decided to give the 4Watt Fuse a try. I was attracted to the Fuse at first simply because of its size. As I’ve already mentioned, the product is the perfect size to be mounted on the rear rack of a bicycle, which is how I knew I would most likely use the product. The fact that the solar panel could be mounted to a backpack or used in almost any outdoor application was simply a bonus. The other thing I was excited about with this Voltaic solar charger was that the charger had not only one, but two separate indicator lights. The light on the exterior of the panel lets you know if the panel is getting any sun… and the lights on the included USB battery indicate whether or not the battery is low, half-way charged, of entirely full. After a short amount of time using the Voltaic Fuse for myself, I realized that these two indicator lights are one of the major features that separate Voltaic products from so many other solar panels on the market – they make it easy for you to know when your products are charging and when they are finished being charged! Finally, Voltaic has gone out of their way and made it super easy for you to find the correct adapters for almost any electronic device being made. Because it seems as though each and every electronic device now days has its own specially designed charger, this means that the way your electronic item connects to the Voltaic Fuse is going to differ from item to item. Other solar companies leave you on your own in this area. They either don’t have the adapters that are compatible with their panels (therefore making their charger unusable with the electronics you want to power) or they leave you on your own to search for the correct power adapters (something only an electronic enthusiast might be able to figure out on his or her own). But with Voltaic, the company website contains a whole list of potential devices that you might with to use with your Voltaic solar charger… and then allows you to simply purchase whichever adapter you need for the solar panel of your choosing. The buying process is easy and Voltaic has priced the adapters at extremely affordable rates. I’ve been traveling by bike for more than thirteen years… and over the years I have started to carry more and more electronic devices with me. That’s fine and all, but the problem with constantly being mobile is having to find a place to plug in and recharge whatever electronic devices you might have with you and be using on your travels. It used to be that when the battery in my camera, GPS, MP3 player or whatever electronic gadget I had with me would start to get low, I would have to seek out some kind of public business (a restaurant, supermarket, fast food chain, campground, etc) where they would let me plug in my charger and device. Then I would either have to sit there with the charger for several hours while it regained power, or I’d have to leave the charger and my valuable electronic item in the care of some stranger, and I’d be worried about it getting stolen, lost or broken while it was out of my care. The Voltaic Fuse has changed all that. Now that I am carrying a solar panel with me on my travels, I hardly ever have to plug my electronic devices into a wall socket anymore. Instead, I simply attach the Voltaic Fuse to the back of my bicycle each morning as I prepare for my ride and it sits there behind me all day long as I travel from one destination to the next. At the end of the day, when my iPod and camera batteries are low, I simply remove the external battery from the main compartment inside the Fuse (the battery is usually full at this point – after a full day in the sun) and I then plug the external battery into whichever device I have that needs recharging. I press and hold down the large circular button on the top of the Fuse’s external battery, the lights blink, and then I know that the battery is now transferring its stored up power to whichever electronic gadget I’ve plugged into it. An hour or two later, the power has been transferred from the external battery to my iPod, camera or whatever device, and then I’m ready to go for the following day. This process then repeats itself on a daily (or as needed) basis… and as long as the sun is shinning, I never have to worry about finding a local business that will let me plug in my battery chargers… and I no longer have to sit for hours, wasting time away while my batteries recharge. That’s what I like so much about the Voltaic Fuse and solar chargers like it. It works during the day without me having to do anything to maintain it… and when I need to use it in the evening (to recharge my devices) it is there for me, ready to go to work! In the photo below you can just barely see the Voltaic Fuse sitting on the rear rack of my bicycle. That’s one of the things I like most about the Voltaic Fuse – it fits perfectly on the back of my bike, works wonderfully, but doesn’t stick out like a sore thumb. Q: How long does it take to charge the included external battery? A: It depends on hot sunny it is outside. One hour of good sunlight will give you about 3 hours of talk time on a cell phone. But to charge the battery all the way up takes about 7 or more hours in the sun. Q: Is the Voltaic Fuse waterproof? A: Voltaic solar chargers use waterproof fabric in the cases as well as for the solar panels themselves. However, the chargers are not completely waterproof. In modest rain, simply adjusting the zips on the sides of the product so that they are not open at the top of the bag should do. If submerged entirely or in a heavy, extended rainstorm, water will eventually leak in. For the most part, however, you’ll want to keep the Voltaic battery dry just as you would your phone or camera. When it starts to rain heavily, I usually take the solar panel off the rear rack of my bicycle and slide it inside one of my bicycle’s rear waterproof panniers… and then I pull it out again once it stops raining. Q: How durable is the solar panel? Will it survive rough travel conditions? A scratch- and UV-resistant and self-healing coating. This means they’ll stand up to all kinds of abuse. To clean to solar panel itself, simply take a damp cloth and wipe away any surface dirt. The sun on a hot day or a hair dryer will melt away any minor scratches. Q: Can you charge a laptop or tablet with the Voltaic Fuse? A: No, the solar panel on the Voltaic Fuse is not large enough or powerful enough to recharge a laptop computer or tablet device. If you are looking for a solar panel capable of charging a tablet or laptop, however, Voltaic does make other products for this – namely their Array, Fuse 10W and Generator chargers. Because of the wonderful success I’ve had with the Voltaic Fuse on my bicycle tours, I am looking to purchase the larger Voltaic Fuse 10W in the future so I can travel with my motorcycle and be charging my laptop and other electronics while I ride during the day. Q: Is it possible to use the solar charger without the included external USB Battery? Can you charge from the solar panel directly to your device? A: All of the Voltaic chargers some with a battery that stores power and delivers it to your devices on demand. The battery provides a stable power source at the right Voltage to charge your devices. The battery can be re-charged from the solar panels or other power sources like an AC or DC charger… or via USB and your computer. In the case of the Voltaic Fuse, there is a connection built into the device that allows you to charge your electronics directly through the device without the use of the external battery. This is very useful for charging digtal camera batteries, but it won’t work for charging most modern smartphones and laptops. Most electronic devices require a stable output supplied by the battery and will charge very slowly, inconsistently, or not at all if plugged directly into a solar panel. So, while some devices may be able to be charged directly from the solar panel, Voltaic recommends (and I have had the most success) using the included USB battery for consistent results. Q: I have another question about the Voltaic Fuse, solar panels, and whether or not my specific electronic device will work with the product. Can you help me? A: The best place to look for further information is on the official Voltaic Systems website at www.voltaicsystems.com. Or see the Voltaic support page for common questions and answers. The best thing about the Voltaic Fuse is that it works. It charges quickly, the included battery functions as it should, and it gets power to your devices in a short amount of time. The product is easy to use, fast, and cable of handling life on the road. The next best thing about the Fuse (and all of the Voltaic solar charger products) are the indicator lights that let you know when the panel is charging and how full the included battery is. Without these lights, you’d simply have to guess as to whether or not the device was functioning at all… and you’d never know if the included battery (as well as your own personal electronic items) were ever fully charged. But thanks to the two different indicator lights on the product, you will now know when the panel is getting a charge from the sun and when the included battery is either low, half-way, or entirely full. I wish it were possible to charge my electronics directly from the solar panel without need for the included battery, because this would eliminate a significant amount of weight from the product itself, but I understand that this is not possible with many electronic devices. This isn’t a design flaw that Voltaic can be blamed for. Instead, it is an issue having to do with the design of so many electronic devices that are currently on the market. Because most electronics require a steady flow of electricity in order to recharge properly, you must use the included Voltaic battery to recharge most of your electronic gadgetry. That’s just the way it is, but I wish it weren’t so. Along a similar vein (reducing excess weight), I think the Voltaic products could be made much lighter. The core of the product is simply the solar panel on the front and the battery on the inside. The large fabric material and the straps found on the back of the Fuse are great for storing additional items and attaching the Fuse to a bicycle’s rear rack, a large backpack, etc… but all of this fabric makes the product heavier. For many outdoor individuals, weight is an issue, and if the Fuse were just a little bit lighter, I think it would be even more amazing! Conclusion: What Are You Waiting For? Get One Now! Overall, the Voltaic Fuse has totally changed my life. I will surely be traveling with the Fuse (or similar Voltaic products) on my future hiking, biking and motorcycle adventures… and my success with solar panels in these areas has sparked my interest in using solar in other areas of my life as well (i.e. for my home, car, etc). If you like to hike, ride a bike, drive a motorcycle, go canoeing/kayaking, or generally just spend a lot of time outdoors and you are looking for a way to power and recharge your electronic devices without having to return to civilization and plug into the power grid, then look no further! Grab yourself a Voltaic Fuse… or a similar solar charger from www.voltaicsystems.com or Amazon.com. 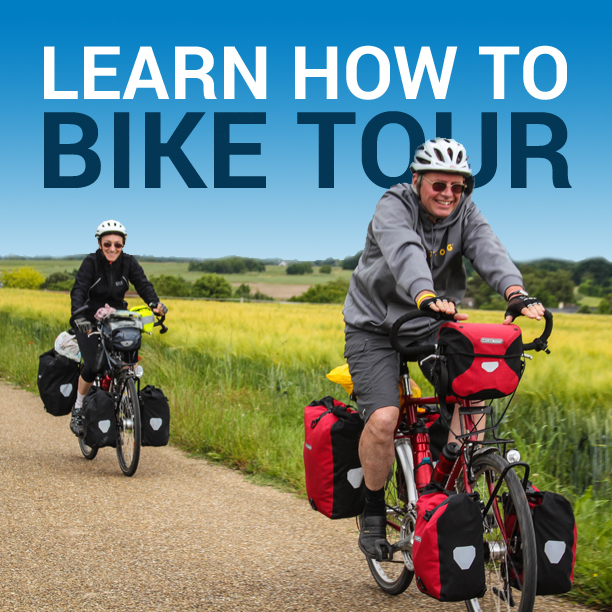 For more information on bicycle touring with a Voltaic solar panel, see this page on the official Voltaic website. Questions? If you have any questions about using the Voltaic Fuse that I did not answer in this review, leave a comment below and I will get back to you as soon as I can. Comments: If you have used the Voltaic Fuse yourself, I’d love to hear your thoughts and comments on the device. Leave a message below and tell me how you’ve used your solar panel, which electronics you recharge with it, and what kinds of successes and/or failures you have had with this or similar solar panels. This entry was posted in Bicycle Touring Pro Articles, Electronics, Featured Articles, Main Articles, Product & Service Reviews, Products and tagged bicycle touring pro voltaic review, bicycle touring solar charger, bicycle touring solar panel, foltaic 4watt, solar panels for a bicycle tour, voltaic, voltaic 4 watt solar charger, voltaic fuse, voltaic fuse 4w solar charger review, voltaic solar charger review, voltaic systems. I have used it in England. I found that despite being out all day with it, it only charged my iphone 10% up. I suspect it is because the strength of the sun is not strong enough to fully charge it. I will try it again in southern Europe in a few weeks, I hope it works better then. Mel, were you charging the iPhone plugged straight into the solar panel? Or were you using the included battery. As I mentioned in the review, the panel works best if you charge the included USB battery first… and then use that battery to charge your device. Otherwise, it takes a long time to charge… or might not charge at all depending on the device you are trying to charge and the way the battery in that device is designed to function. Again, read the section of the review that discusses charging straight to the device vs. the included USB battery. What about the powermonkey? I’ve got the explorer model, it fits into my pocket, it has the two indicators light and it does exactly everything you mention. I have it with me and it works very well. Also extremely lightweight. The extreme edition is a little bit bigger and heavier but is much more powerful, you can even chatge qn ipaad. Have you tried them? If yes what was the problem? I use an Orange Joos and I must say it is incredible. It weighs a bit more but can be left out in the snow and rain. It can even be submerged and still charge. It will charge my tablet from 0 to 100% on a full charge. It also only takes about 5 hours in the sun to fully charge. The downside is the weight, 24oz. The new dynamo headlight from Busch & Müller LUMOTEC IQ2 LUXOS has a charging feature for devices. Great for keeping phones and GPS units charged. An USB receptacle is integrated into the handlebar switch. Charges mobile devices via USB (mobile phone, GPS receiver, MP3 players) with USB power. The cache battery inside the lamp (see below) provides constant charging power. How do you charge your Mac Pro? You did not understand my question. I know this solar panel isn’t to strong to charge laptop. You have Mac Pro, right? Where you charge laptop? I’m sorry Ralvis. I did misunderstand you. When it became necessary for me to charge my laptop, I simply had to find a place to plug it into the wall. I have been using Power Monkey Extreme , maybe I was unlucky but the USB charge lead only worked occasionally and 8 days into a tour failed completely , but I was camping next to th Alternate Energy Centre in Machynlleth and bought another lead and hade the right tip as it uses USB to a Jack , was not impressed with that . when working it is good charging I-pod , I-pad mini , Garmin 800 and compact camera . Thanks Darren for a great article, again! I would be interested on exactly what devices you charge up, and how often. Could you make a picture of all the gadgets that you charge up with this (to make it visual), and with which frequency do you recharge them? I see there is a 10W version of this Voltaic Fuse, is that an overkill? What other devices did you consider, and why did you settle on the Voltaic Fuse 4W? Darren, very good to hear that panel is working so well for you. I have a “dome” that I power with solar panels and it’s worked very well. I have a C Crane travel radio with very small solar panel, crank dynamo and usb adapter for charging my cell phone. Small and lightweight enough not to be an issue for touring. I put rechargeable NIMH batteries as an additional power option for the radio and looking for a USB AA AAA battery charger to re charge bike light batteries, etc. from the radio as well. Quick charge would probably be best. Thanks for sharing this info. Cheers! have you used a dynamo before? Are you considering it in the future? I have a dynamo, but I’ve never used it. I want to try it sometime, but I think I’m a little afraid to use it on a long tour. I don’t want to be stuck with something that doesn’t work and then need to buy a new wheel mid-tour. I’ll get around to it one day – for sure! Darren, thanks for the extensive review! The Voltaic 4W looks like a great device. I agree that the 10W version would be better, not only for ipad/laptop requirements but also to provide better charging and battery capacity at higher latitudes or on a winter tour. I have found the PowerMonkey Extreme a very good buy but it comes with only a 3W panel. What appeals about the Voltaic units is the zip closed section for holding the battery and other devices to be charged. It seems a better solution for device and weather protection. While it is lighter and with a decent 11W panel, it lacks the Voltaic zipped enclosure to protect your battery/devices that prevents them falling out on rough roads. I look forward one day (from any manufacturer) to a totally waterproof panel and zip enclosure the size of the Voltaic 4W, with a panel that outputs 11W or more to a large capacity battery (with 5V and 12V output)! Excellent innovation. we can use so much power by using this. Actually i liked the concept. I have not yet purchased one of these solar panels, but have seen very few comments of anyone unsatisfied with this product. I do want to mention that Voltaic says that all of their kits will charge an ipad. Its just not recommended by them with some of the kits, as they want satisfied customers. (Unlike many other companies who make generous claims that don’t pan out in the field.) Am planning on buying one of these soon! Mel, did you find charging the included battery helped? I’m considering it for UK and am worried that it won’t charge on sunny days, does it charge on cloudy days, i.e with just daylight? I see your topic, and your picture.I have used it in England. I found that despite being out all day with it, it only charged my iphone 10% up. I suspect it is because the strength of the sun is not strong enough to fully charge it. I will try it again in southern Europe in a few weeks, I hope it works better then.